It’s been a year since I started my No New Clothes Project of buying only used clothes (underwear, bras and socks excluded). When I started this experiment, I wondered, could I really do it? Would the temptation to buy new be too great? Would it be frustrating sorting through used clothes? Would I still look good wearing used clothes instead of new? Those answers in just a minute . . . but first, here’s what I ended up buying. All items except for #8 were bought at Goodwill. All prices include tax. I ended up spending less than $110 on all my clothes for the entire year! Now, let me answer the questions I had at the beginning of this project. Hell yeah, I did it! As the saying goes, “If you want to lose weight, don’t walk by the donut store.” To avoid temptation, I stayed out of clothing stores and avoided the clothing section of department stores. 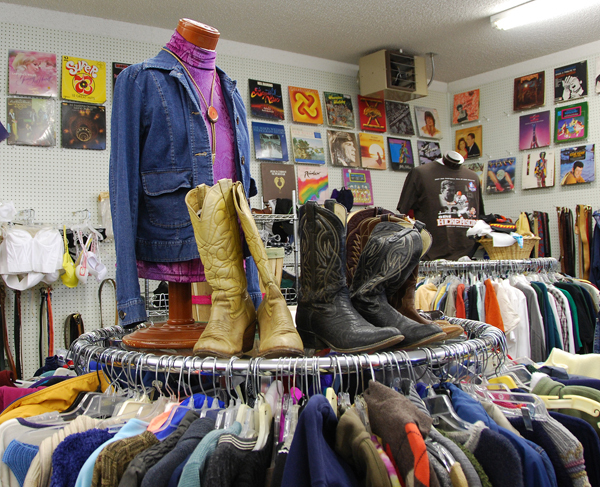 I shopped only at places that had great prices on used clothes, mainly the Goodwill and Value Village. I went shopping knowing that I might not always find what I was looking for. That’s true whether you’re shopping for new stuff or used stuff. And as I wrote before about shopping for used clothes, I shopped when I knew what specific items I was looking for. That helped me to stay focused and not get frustrated. Yes! All of the clothes I bought were in really good or great condition. In the end, the No New Clothes Project helped me learn something much more important than just saving money by buying used clothes over new ones. It helped me to break a die-hard habit of buying without thinking. This year-long experiment was a real wake-up call for me. Because of the conscious way I bought my clothes for a whole year, I now apply that conscious way of thinking and buying to everything else I need in my life. I feel a lot better about how I spend my money and what I spend it on. And I owe it all to this one little experiment. Thrift store photo by sparklingdawg. It’s so amazing what you can find in thrift stores when you really look and are determined to shop there for clothes and other things. I feel so grateful when I find items that I need and would never be able to afford otherwise. I’ve added some great things to my closet that I might have never even tried if I had to pay full price for them and I don’t know about you but that’s one of the best parts of it all for me. That’s one of the best parts for me too, Jo Ann. I feel that in a thrift store like the Goodwill, I can try on anything. Because I know that if it fits and I like it, I can afford it. It’s so empowering to shop in a place where you know you can afford anything there.